The heat of the day, the chill of the night and the countless mosquitos that follow. These are the least concerns of gallant Nigerian soldiers as they fight to reclaim Nigeria's formerly lost territories. Death on the battle field seems preferable to the being incapacitated or made to relive psychological horrors of terror. Since Boko Haram's insurgency started in 2009, over 100,000 have been killed and 2.3 million others have been forced to flee their homes. The mindless killing of women and children across Nigeria's north-east region ranked the sect as the world's deadliest terror group by the Global Terrorism Index in 2015. 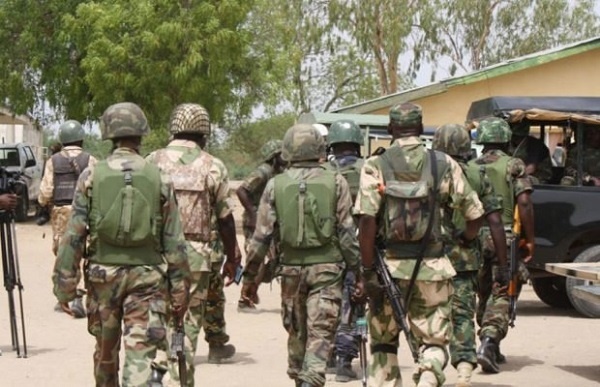 The Nigerian Army have remained brave and relentless; sending troops to the northeast to combat the insurgents. One of such national heroes was Monday (not real name). Monday, a soldier attached to the Nigeria Airforce Base in Lagos, went, saw and has a lot of stories to tell. Monday is not new to battle fields. His entire life has been a struggle against barriers that tried to blur his vision of success. He spent most of his formative years with his elder brother in Lagos after he was sent over by his parents to acquire western education. He wanted to be a lawyer but he could not achieve it because his brother was not willing to fund his academic pursuit. His determination to get educated by every humanly possible means made him to leave the comfort of his brother’s home to fend for himself. “When I finished secondary school, my brother who I was staying with said he had no money to sponsor me but he sponsored his children to university level. “I was very annoyed, so I bailed out and started struggling on my own. “I joined the Force and because of my good results, I was sent to Zaria to obtain my diploma. I was later sent to Ogun State University where I obtained my degree”, he said. The father of three was working with Wapsfield Nigeria Limited in Lagos before enrolling in the Nigerian Airforce in 1985. His attraction for the Nigeria Military came after an encounter with the former Inspector-General Police Muhammadu Gambo-Jimeta. “I was running an errand for my boss at Wapsfield when the car I was driving ran into the convoy of the Inspector-General of Police, Muhammadu Gambo. “I was shivering because the occupants of the car were fully dressed in police uniform and they had guns. “The IG came out of his car, inspected the extent of the damage and saw my car was more affected than his. His orderlies wanted to hit my car but he stopped them. “He ordered them to enter the car and they all drove off, leaving me alone there. “It was at point I got inspired to join the Force because of the level of authority they command. “I obtained a form at Legico Airforce Base in Victoria Island and I was chosen”, he said. His firsthand experience of the bloody sect was in 2011 after he was posted alongside some other colleagues to Borno State. Even though he was trained to be battle ready, the softer part of him crept up after he received the news of his posting. “I was afraid, everybody was afraid. In fact, a soldier ran away from the barracks after he got his letter. “My family members became very afraid as the thoughts of losing me on the battle field crept in. “The battle was very tough, but as a guard commander, I was always on the battle field leading a troop. “The insurgents killed many of our boys including a classmate who buried his father three months earlier. “It was God that saved my life as many of my colleagues were killed, he said. After spending 11 months combating the insurgents in Borno, he returned to Lagos to the warm embrace of his family. It was however shocking to him when he was asked to return to the battle field again three years later. He said he was very angry and had to confront his commander at the base. “When I asked my commander why I was re-posted to Borno State, he said ‘a good turn deserves another’, meaning I was sent back because of my excellent performance the last time. “Well I took it in good faith, called my pastor who prayed for me and I went. A lot of our boys were killed again. "My colleague, who was my neighbour at the barracks was killed", he said. Monday had several close shave with deaths during his time on the battle field but there is a particular one that remains ever green in his memory. "I had just been deployed to Maiduguri from Lagos in 2011. As I was coming down from the helicopter that brought us, I was asked to assemble some boys to the battle ground at Sambisa forest immediately. "As a soldier, you are trained to be always ready for war. So I gathered some of my soldiers and we went. "On getting there, the Boko Haram soldiers were all over the place and we had limited weapons to fight with. "They shot at us, and we shot back. This continued for sometime as three of my boys were killed instantly. "I called for re-inforcement but it didn't come as we were taking more fire. I saw that we were losing ground, so I asked the remaining boys to retreat. "It was at this point that I lost my deputy as he was shot at the back right beside me. "It was very painful but we escaped and returned to base", he said.